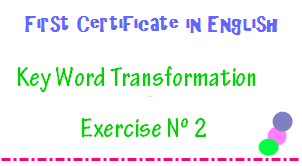 Complete the second sentence so that it has a similar meaning to the first sentence, using the word in brackets. Use between two and five words. 1. This is the first time you have seen this play, isn't it? 2. It doesn't matter which one you choose. 3. Peter said that going there by myself wasn't a good idea. 4. It's three days since the dog was fed. 5. Students must be responsible for their own rooms.